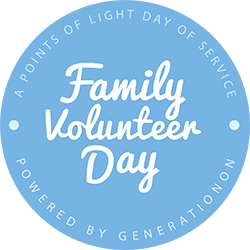 Family Volunteer Day is a global day of service that celebrates the power of families who work together to support their communities and neighborhoods. It’s an amazing day to bring your family together and make your mark on the world. Don’t miss out on this incredible opportunity! Kick off the holiday season by leading or participating in a volunteer project on Saturday, November 17 (the third Saturday of November). You can make a difference with projects for the whole family or find a volunteer project to join in your community. Help combat hunger among our homeless neighbors! Father Joe’s Villages staff and volunteers offer more than 1 million meals each year in their dining rooms and the Franklin Antonio Public Lunch Line. 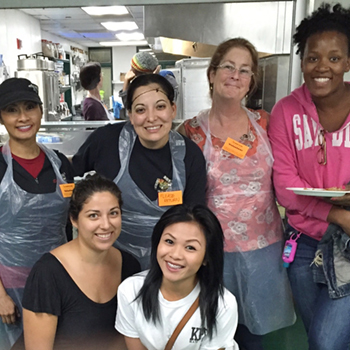 Come join Father Joe’s Villages kitchen crew as they help prepare and serve meals to the men, women and children that live on the streets of our community. Volunteers will be in the kitchen preparing food, serving food 'cafeteria style' and helping in the dining area. As a result, neighbors can focus less on hunger and more on building a brighter future. Project Requirements & Important Notes First Time Volunteers: Please print and sign the following documents: Volunteer Agreement Parent Authorization Form (for minors only) Food Handler Teach and Test Attire: No tank tops, shorts, or open-toe shoes are allowed. If you do not follow this dress code you will not be able to volunteer. When You Arrive: Underground parking is available. Enter from 16th Street. You will have to buzz in and tell security that you are volunteering to serve lunch/dinner. Park and go upstairs to the lobby. Exit the lobby building and go left along the sidewalk and straight through the entrance to the courtyard. ​We will be in the PMC Kitchen (not the family kitchen) which is the last building on the right side as you walk through the courtyard/blacktop area. It is building number 16 and has entrances on either side of the security booth. You'll enter a smaller courtyard and the door to the kitchen will be on the left. Our Team Leader will be inside to check you in. About Father Joe's Villages As San Diego’s largest homeless services provider, Father Joe’s Villages offers a wide variety of housing and services at several locations. They provide housing, rental assistance, healthcare, food, clothing, education, job training, mental health, addiction treatment and child development in an internationally modeled “one-stop-shop” approach. Enjoy the canyon as you remove weeds, do a little watering and pruning! 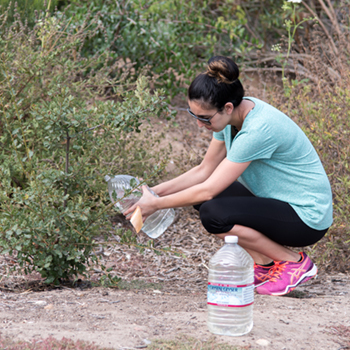 While removing invasive species, you can learn all about San Diego's native plants and ecosystem. This is great project for kids to get hands-on and learn about their own backyard! With your help, we can help keep San Diego thriving and beautiful. During the rainy season (Oct – April) you will get your hands dirty and plant native species! Come spring time, you can enjoy the satisfaction of watching your efforts grow and blossom. One of the most important environmental needs in San Diego is protection and revitalization of its fragile ecosystem. Southern California hosts some of the most fascinating species of plants and animals in the nation! Project Requirements & Important Notes Attire: You MUST wear closed-toe shoes and clothes you don't mind getting dirty. Bring: A reusable water bottle, a hat, and work gloves (if you can) Waiver: For Minors, please print and sign the City of San Diego Minor Waiver​ About City of San Diego Parks and Recreation The mission of the City of San Diego Parks and Recreation Department is to provide healthy, sustainable, and enriching environments for all. Their vision is to connect all to the City’s diverse world class park system. The Friends of the San Diego River Mouth, a chapter of the San Diego River Park Foundation, needs volunteers with an interest in helping to save and restore one of the last remaining Coastal Dune and Wetland Habitats in San Diego. Please join us from 9:00am to noon. Over 95% of these habitat areas no longer exist in California. Home to many endangered birds, fish and mammals this area needs your help to remain as a viable habitat area. An educational walking tour will be included. From cooking to serving to cleaning, Urban Angels runs the entire kitchen at Connections Housing, a state of the art service center and residential community designed to reduce street homelessness. Is your organization hosting a service opportunity on Family Volunteer Day and would like it listed? Contact us at info@handsonsandiego.org.